Dynamics CRM 2011 Polaris what is inlcuded? So what is this Polaris release and what is included? The first thing to note is that Polaris is only for Online except for x browser support that will be available for On Premise through the Rollup 12 release. So what is in Polaris? The image above depicts the functionality included in Polaris. I will now touch upon some of the key ones in a little more detail, hopefully in plain English! Browser Flexibility – This will enable CRM to be run on a number of browsers including Safari on the IPAD. Yammer Integration – Tighter integration between CRM and Yammer beyond the current embed functionality. This will enable features such as Like, Follow, visible from within CRM or Yammer and the ability to do global search from yammer to CRM. Yammer will become the future Activity Feeds. Aligned to this was the recent announcement of pricing plan changes that can be found here https://www.yammer.com/about/pricing/ making it very affordable to organisations to adopt. Skype integration – As per my previous blog this is a great new feature and will change the way we communicate with our customers from within CRM. Bing Maps – The updated new UX will include native integration to Bing Maps for Contacts and Accounts for free. Pre Defined sales and Service processes – So what is this? Well rather than you telling your partner your processes, your partner will be able to present a best of breed sales process as a starting point from which you can edit and tweak. This will save time in deployment and provide a greater starting point than just rich functionality to configure. Enhanced Complex Deal Management – Microsoft Dynamics CRM will provide additional capabilities to track and manage stakeholders, competitors and pursuit teams for leads, opportunities, contacts and accounts via the new UX capability. 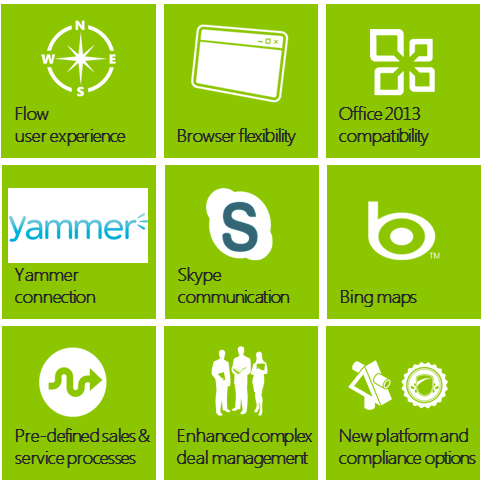 So why should you care about Skype and Dynamics CRM Integration? 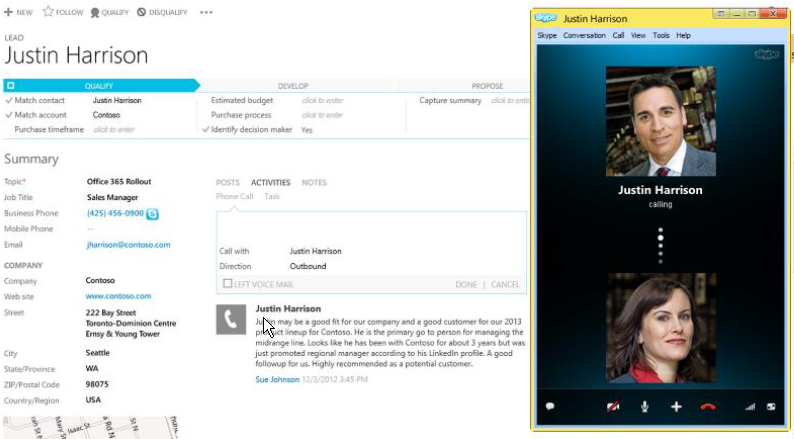 So recent announcements have indicated that Skype and Dynamics CRM will be integrated out of the box in the Polaris December 2012 release http://crm.dynamics.com/en-us/polaris. So what does this really mean and why should we care? I could keep on going with regards the features and facts but the key thing to note is it is essentially a Communications company that enables calls via VOIP or via PSTN network out of the box. 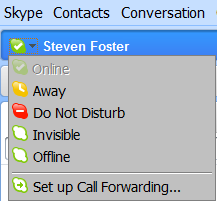 But what about Lync you say, this is great for internal access but for external calling a few but not many enable. So with Skype you can now make external calls straight from CRM, without the need for phone integration! Plus don’t forget the status, you will now have access to view whether your internal or external contact is online, busy, offline etc giving you greater access and visibility of the people you are interacting with. So in a nutshell what does this mean? So this is not just a cool feature, its going to change the way you engage with Customers, Communicate with Customers and view Customers.